Last year for Thanksgiving (2013), we celebrated in an unusual way: small. Usually, our family Thanksgiving celebration is a huge gathering of family and more food than you could eat in a week. However, last year my parents were touring Israel and Greece over the holiday and two of my brothers were visiting family elsewhere. So it was just our family and my middle brother, Ryan, and his wife and son. They invited another couple along so we had a total of 6 adults and our kids. 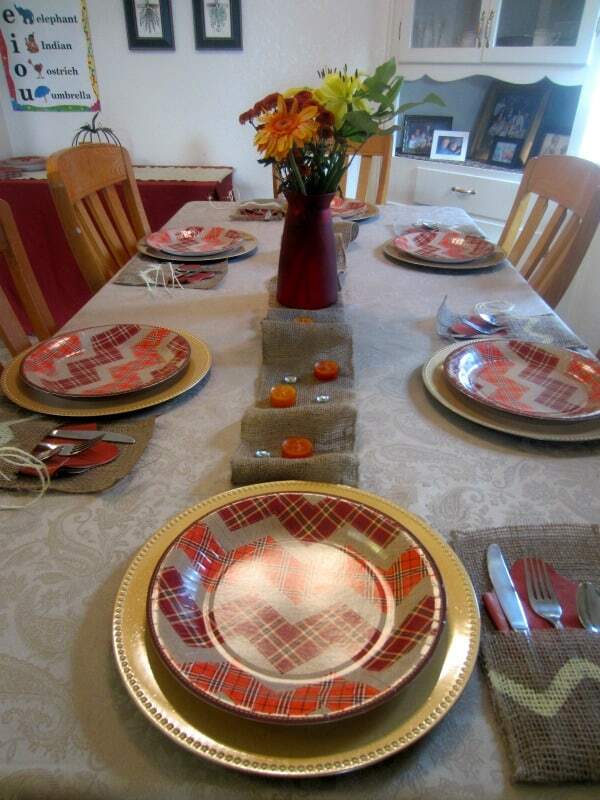 For the first time since our very first Thanksgiving, I had the opportunity to host dinner and set the table. I decided to go with a casual, yet elegant look and these burlap utensil holders I saw on I heart Naptime pulled the whole setting together. The best part is you can make them in just a few minutes and they are no sew! Paint with craft paint using a dabbing motion. 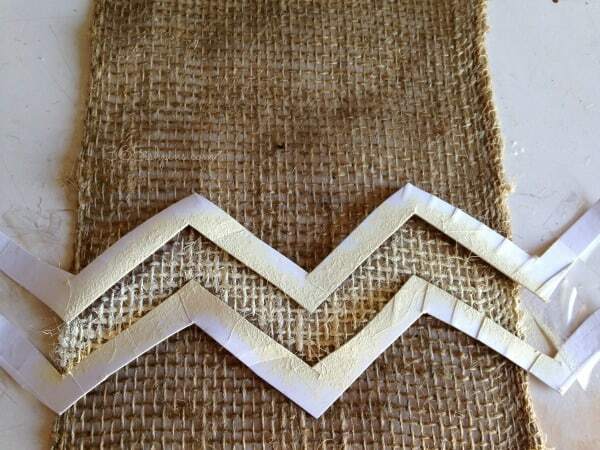 Fold up the bottom edge about 5″ and fasten with hot glue. It will only take a couple of dots of glue on each side to hold it in place. Thread a piece of twine through the right side and attach name tags. Fill with a napkin and place utensils on top! 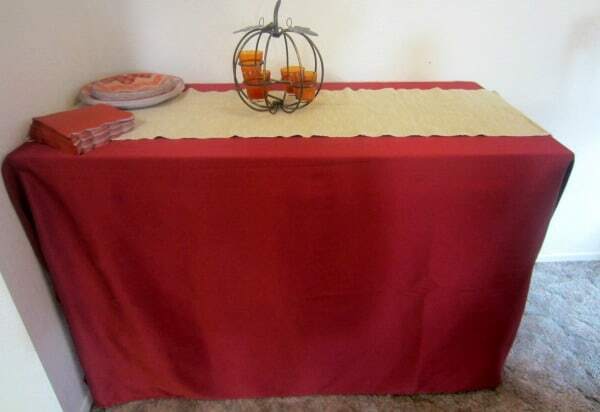 I used some more of the burlap ribbon to make a runner down the center of the table. I added a few orange tea light candles and some glass beads for sparkle and light. Some fresh flowers pulled everything together. The best part about this is that I chose to use high quality paper plates, making cleanup a breeze! The table in the corner was actually a desk covered with a tablecloth. I set all the dishes on that table and we ate buffet style. While it wasn’t our traditional Thanksgiving celebration, I really enjoyed hosting and having a change to decorate my own table last year! This year (2014), we are all back in town and will have even more family visiting. 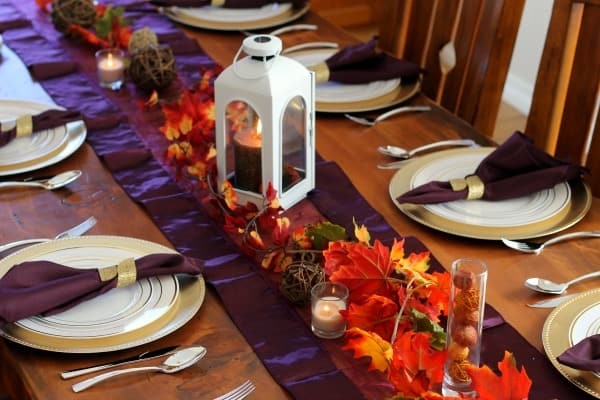 My parents will be hosting and hopefully soon I’ll be sharing a grand and elegant table setting with golds and purples. I can’t wait to decorate their giant table! 🙂 What are your plans for Thanksgiving this year? 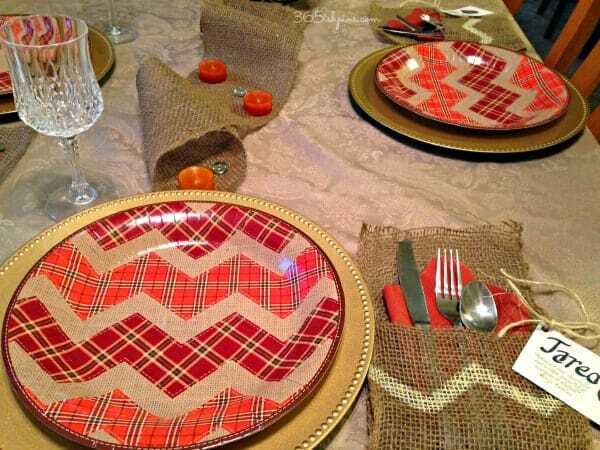 I love burlap in a centerpiece or table setting. It has such a rustic charm. Your utensil holders were great. I could see using these for homemade gifts this year too. Cool! 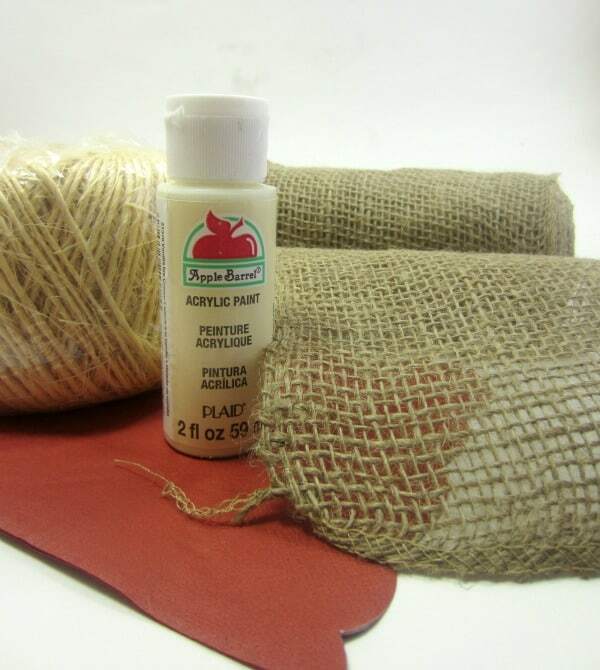 I love burlap in table settings. I have to travel this Thanksgiving so I won’t get to use them, but pinning them for use next year! Such a clever idea, Nichole. Love the gold chargers and plate combo. I did see some pretty neat paper thanksgiving plates at Walmart too. Very clever. Where did you find your plate holders? The gold chargers? I think I got them at Hobby Lobby. That’s where I got the paper plates, at least. I know they sell them at Home Goods, as well. If you shop online, smartyhadaparty.com has all sorts of colors and they are pretty inexpensive!